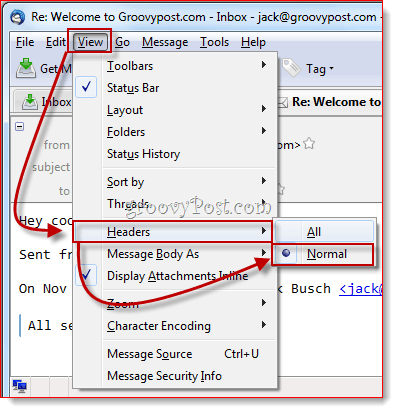 Much to the chagrin of die-hard Thunderbird users, Thunderbird 3 introduces some frequently used buttons into the header on the message pane. Where there was once blank space are now some big honkin’ Reply, Forward, Archive, Junk and Delete buttons. While perhaps convenient, these buttons take up valuable screen real estate, which can be real buzz kill for those with tiny laptop screens. 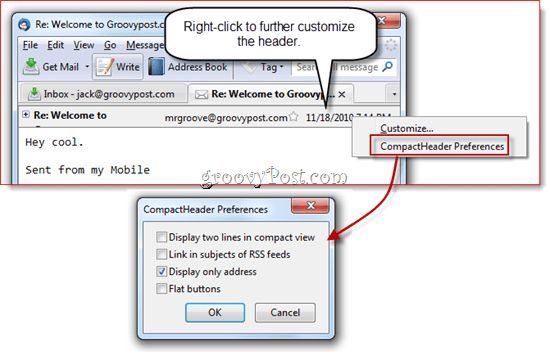 Here are few groovy tips to help you reclaim that space by customizing the message header in Thunderbird. By default, Thunderbird 3’s message pane header takes up a whopping three lines, plus all that room for buttons. We can put an end to that. If you have just a massive amount of junk in your message’s header pane, then it’s likely that you’ve accidentally enabled Thunderbird to show all header information. Luckily, this is a very quick fix. Simply click View > Headers > Normal. This will give you some instant relief and make your header look more like the first screen shot in this post. The added buttons were so controversial, that Mozilla included a solution in their FAQs. 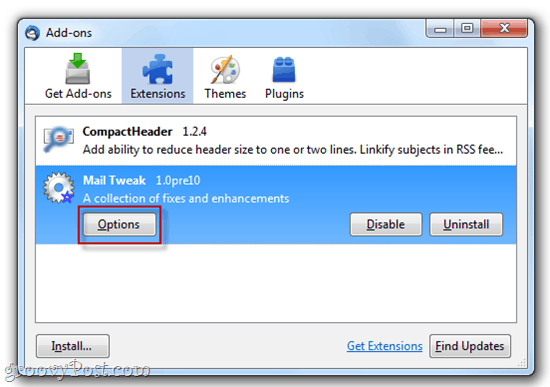 Mozilla recommends checking out one of several Thunderbird Add-ons that modify the header. The best one I’ve found so far is called CompactHeader. This lets you collapse the header so it takes up just one line. After installing CompactHeader, you can click a tiny little minus sign in the top-left corner of the header to collapse the message header. Click the + to bring it back. You can right-click in the top-right corner of the message header and click CompactHeader Preferences for more options. 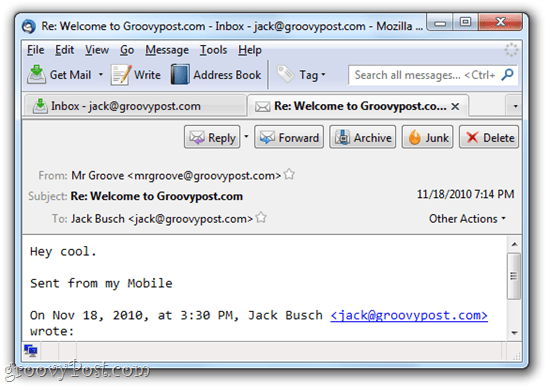 For instance, you can cut down on space by choosing Display only address, which removes the name of the sender. Or, if the one-liner is too small for you, you can bump it back up to two lines. Mail Tweak is an awesome all-in-one Thunderbird add-on that lets you customize the look and feel and behavior of Thunderbird. 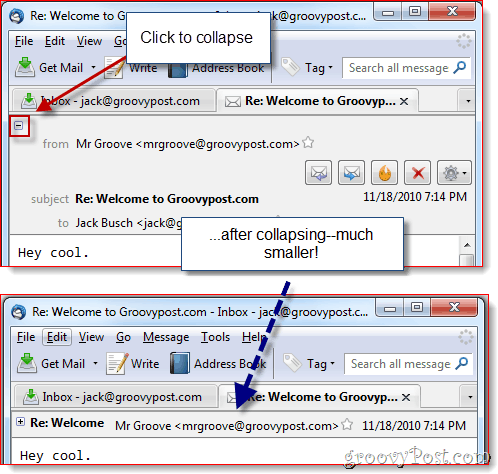 You can also use it to completely eliminate the message header. Install it and then click Tools > Add-ons and click Options under Mail Tweak in the Extensions tab. 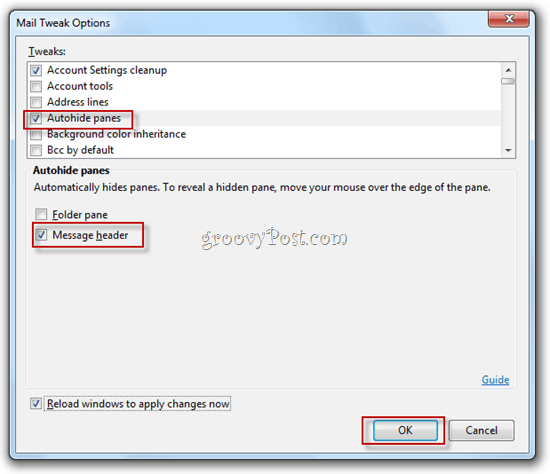 Scroll down until you find Autohide panes. Check it and then check Message header below. Click OK and restart Thunderbird (or check Reload windows to apply changes now before clicking OK). Now, there will be no message header to speak of. Pretty drastic, but for those of us who have mastered the Thunderbird keyboard shortcuts (press CTRL-R to reply), it’s much better this way. So, there you have it. Three easy ways to reduce, collapse or eliminate the message header in Thunderbird 3. Enjoy your new, compact view! Great article! Thanks a lot! the big header are so annoying on my 12 inch display. thunderbird rules! @Tom – Hey no problem. Thanks for the great feedback! 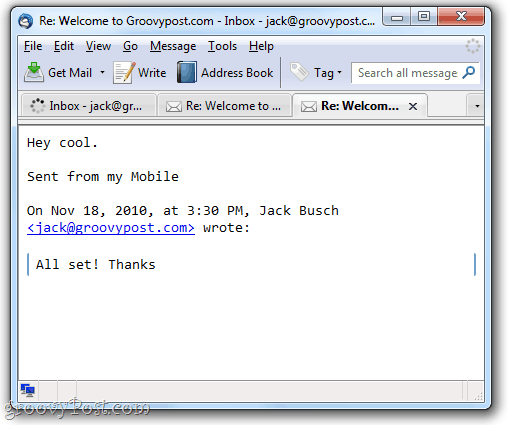 reading your topic, i´m asking how do you do to add the email address on the head message from the email you have received for which you are going to reply. Hi Romain – That’s actually part of the quoted message. Gmail inserts that, it wasn’t done by Thunderbird. Is there any possibility to do it under Thunderbird ? Friday Fun : Looking for the Coolest External Hard Drive Ever? Found it!